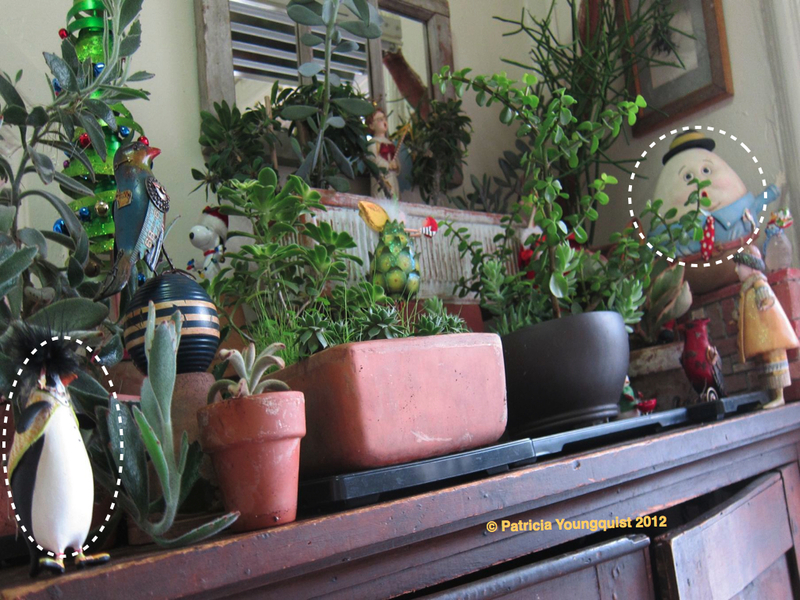 With all the "year-end review talk" going on in my urban (NYC) terrace garden, the Humpty Dumpty figurine in my indoor succulent garden (pictured above, and you might recognize his face from other entries here on TLLG) is now feeling nostalgic. His "position" in my succulent garden is near my kitchen window, so if he really streches his neck, he can eavesdrop on the year-end reviews my one of my ornamental grass varieties known as Ophipogon planiscapus (Black Mondo Grass) is hosting. And today, my visiting bees were the subject of a year-end review segment, which can be seen in a movie posted this morning on TLLG's Facebook Page by clicking here. Be that as it may, all of this reminiscing has caused my Humpty Dumpty figurine to do his own reflections on by-gone times in my succulent garden. As you know, if you follow this TLLG blog, I often feature the escapades of my figurines which you can access by clicking here. Moreover, I also discuss them on nybg's (New York Botanical Gardens) tumblr. And, I guest blogged for My Square Garden about the ambience that results from having figurines in an indoor succulent garden. While my figurines come and go depending on the season, my Humpty Dumpty stays, and today he was missing a penguin figurine (they both can be seen within the circles added to the image below). Humpty Dumpty was especially missing the penguin figurine because today, January the 20th, is Penguin Awareness Day (not to be confused with World Penguin Day which is always on April 25th). 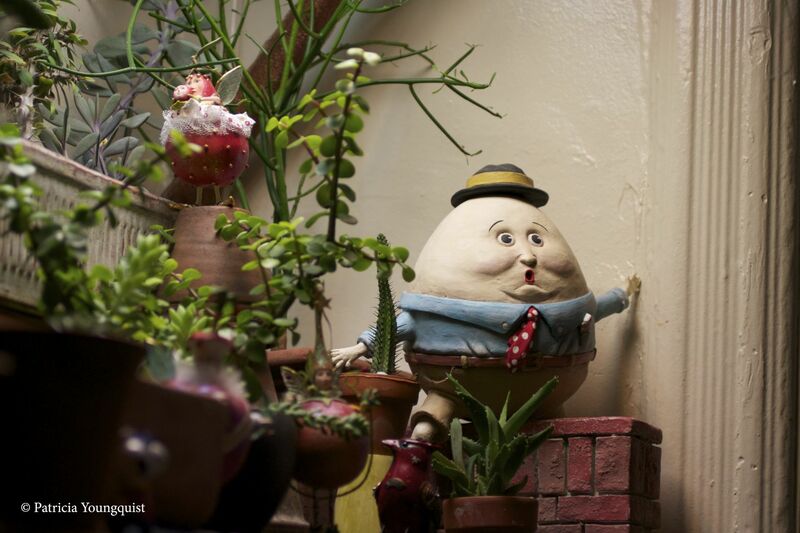 But, to give Humpty Dumpty his due, he kept his spirits up for the succulents and figurines which are currently in my succulent garden. For he, of all my figurines, knows from experience to take things in stride, since all the king's horses and all the kings men can (never put things back together again).